Bluetooth can do amazing things starting from sharing pictures with your friends to sharing files. But that’s not all it can do. Nowadays people are more focused on road safety and wireless gadgets. With that said, Bluetooth headphones are great for those who want to focus on their main activities instead of lifting the phone in the middle of driving or doing their housework. You can enjoy any audio from your device with just a single operation. Below are some of the best Bluetooth headsets for your iPhones. From the best seller in Car Video Headphones section of Amazon, Bluetooth Headset JETech® H0782 comes with a well-designed body that is light and convenient that everyone can use it to answer phone calls and more. 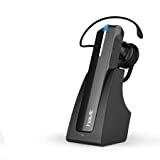 The device features a power button, a micro USB interface that allows you to charge your phone, powerful and high quality microphone with noise cancelation technology, volume adjuster, and an LED light. It saves energy and the sound is very clear from its sound transmitter. Another JETech’s product that does well in terms of phone accessories. This one will also amaze you. With DeepSleep mode, it can extend its battery life up to 14-day of standby time and 6 hours of talk time. Noise cancellation is also present which gives you confidence when speaking or hearing from a crowded area. It strengthens the sound clarity on the wideband-enabled smartphone and you can also see the battery meter on your phone which is very easy for you to know if the battery of the headphone is running out. Here comes the Bluetooth headphone that basically works similar to a phone. It comes with a dock which you can pick up from the dock to receive the call or pick up and press the “K1” button to cancel the call. Once it is not with the dock and there’s a call coming, you can just press the K1 button once to answer or twice to decline. This works really well with the car as the dock can stick to the car’s dashboard and you don’t need to worry about dropping the headset. Its features include clear voice conversations, long standby time (16 days) and talk time (7-8 hours), the charge on the go, and easy pairing. This simple Plantronics M50 headset is a high quality headset that can last up to 11 hours of talk time which is more than the previous products. Moreover, the range of Bluetooth coverage is far up to 33 feet so you can walk around your room while on the phone doing other stuff. The strong Bluetooth signal is enhanced by using the latest Bluetooth 3.0. The same brand with the previous phone but a little fewer talk hours that lasts 7 hours for each charge, but the quality is even better and more durable. It also has the DeepSleep mode for power-saving while you are away from your phone. As for the artists they come with three sizes—small, medium, and large and it is super soft and can fit in your ear perfectly with ease without hurting your ear from long hours of listening. New Universal PChero® headphones are Bluetooth-powered stereo headphones with very good sound quality. Though it looks a bit big compared to single-side Bluetooth headphones, it is super light and slim and smaller than typical headphones. It is ideal for music lovers that they can listen comfortably while walking, climbing, driving etc. It uses memory alloy flexible neckband which gives flexibility and reduces stiffness. The talk time is up to 8 hours which is pretty long and the distance is within 10 meters. It is another best seller in S-Video Cables category. Mpow FreeGo Wireless Bluetooth headset is a new and improved version from its predecessors. Now it supports mute function as well as Clear Voice Capture, own echo cancellation and noise suppression using its latest software. The audio quality you hear will amaze you with how much crisp it sounds. You can also use it to connect two devices at the same time so if you have two phones you can talk on both phones using just a single Bluetooth headphone. This is yet another slim and beautiful stereo headset. 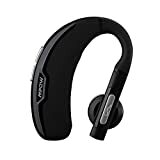 This model comes with colorful design, sound clarity, cushioned earpieces and more. The audio is enhanced using HD speaker and BASS effect. This makes the headphones have CD quality with HD quality calls. It can also auto reconnect once you walk far from your device and come back. It is a perfect companion for your phone. Another quality product is from Plantronics. M55 is a brilliant headphone that has dual microphones that can reduce noises from the wind, traffic etc. It guarantees you that you have the best possible talk time with your partner. It also impresses you with the voice recognition feature. Now you don’t have to press any button just say “Answer” or “Ignore.” Lastly, you will never use your small headset again because it has a built-in feature that your iPhone can send a tone so you can hear where it is hiding. 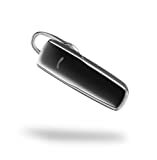 Last but not least, The Mpow Cobble Bluetooth Headset comes to close the list with its high connection strength that allows you to have a clear conversation even a bit far from your phone. With the integrated Siri voice command you don’t need to touch your phone but it you can tell Siri to do the work just from your headphone.